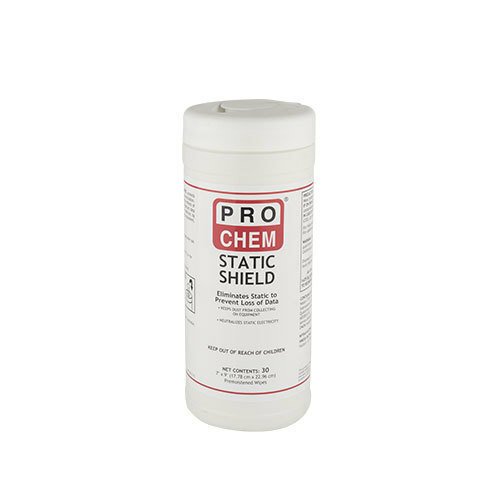 Static Shield | Pro Chem, Inc.
STATIC SHIELD are specially formulated to neutralize static electricity and prevent dust from collecting on computer equipment and other electronic devices. By eliminating static from electronic equipment you are reducing the risk of losing important data that may be stored in computer hard drives as well as damage to similar devices like monitors and television screens. In addition, when using STATIC SHIELD, less dust collects on the surfaces to keep the equipment cleaner for longer. Power down electronic equipment. Simply wipe surface and discard wipe after use. Safety/Note: Warning: Flammable. May cause eye irritation.